LeanAngle: Almost broke my foot today. Almost broke my foot today. Coming home from work on the FJR on Friday I got to learn something else to be careful about. I'm toodling along down the HOV lane and there's a big slowdown. After creeping along for a bit I come over a rise and see the end in sight. Turns out that some folks thought it might be amusing to cause a five car pile up during rush hour traffic and close down the HOV and two left lanes. Anyway, I'm used to this and as we slog on up we get to the point where the HOV has to merge with the traffic that is also merging over. This is always balls of fun. 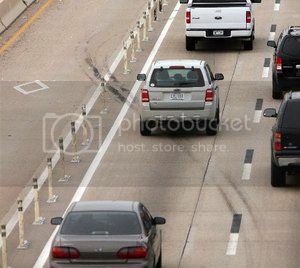 The HOV lanes in Dallas use what I refer to as the "Picket fence system" in that we have this fencing that separates the HOV from the main lanes but going slow enough you can squeeze a full sized SUV between the vertical fence pieces. If you are uncoordinated then you can simply run the fencing down and it'll usually pop up behind you. It looks like this. So at the merge point I pull up between the fence posts and look and a driver waves me out...wow, nice guy. What I don't realize is how close to the left fence I am. See that base on the ground? Just as I start to move forward, before I can pull my feet up, my left toe of my boot catches that base. My foot now is stopped with relation to the ground, but is moving backward with relation to the bike as well as the body which it is connected. Thank goodness for boots and retractable footpegs because my ankle swings right through the peg. However, my heel hits my exhaust pipe. For all intents and purposes my foot has now been placed between the immovable object and the unstoppable force. I got lucky though as my foot bent rotated and popped out really before I knew what happened. Hurt like all get out for about five minutes but made me realize how it could easily have been broken. Like I said, one more thing to keep an eye out for. So, the rest of the ride was pretty much uneventful till I got a few miles from home. We were zipping along at about 70mph and suddenly the traffic in front of me slams on their brakes and we go down to 20mph really quickly. Instinctively I pull to the left as I'm hitting the brakes. Thank goodness because the car behind me finished it's deceleration with the front bumper immediately to my right. No fingers were thrown but I did turn and give him the look of death (concealed by a tinted shield) to which he promptly backed way off and changed lanes. So, managed to learn something new and then use something already learned to survive another ride home.